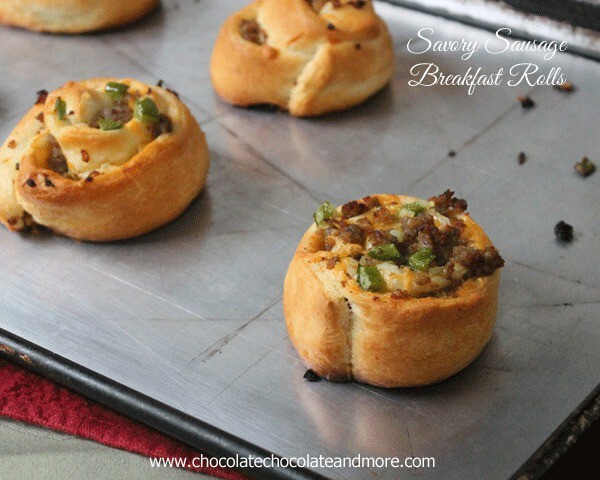 Savory Sausage Breakfast Rolls - Chocolate Chocolate and More! 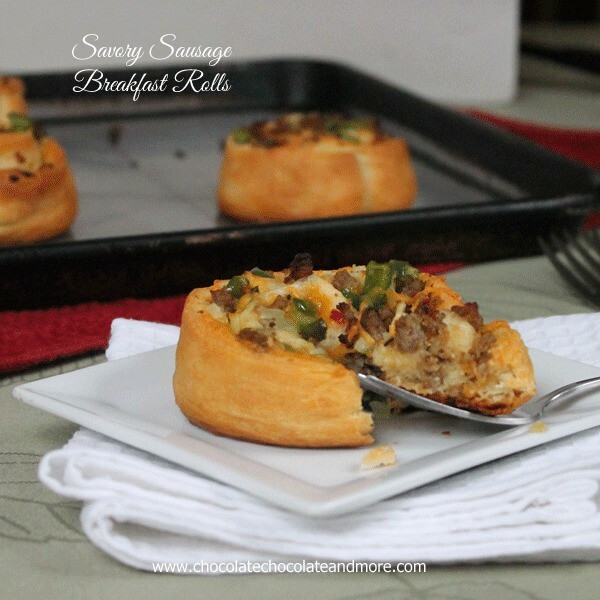 Savory Sausage Breakfast Rolls-easy to make and a great change up from the usual sweet roll. Holidays at my house are all about family. Thanksgiving, Christmas. Spending time together, enjoying each other’s company. The kids forced to stay in the same room with everyone for more than 10 minutes. In fact, we pretty much torture them and make them visit for hours. It’s also about the food. People gather around food naturally. at the table, in the kitchen. The warm comfort of hot out of the oven deliciousness. Holiday food isn’t just about the big meal, which at our house isn’t until around 4 o’clock in the afternoon. No, from the moment we wake up until bedtime, we’re grazing. A nibble here, a bite there. Breakfast sets the mood for the day. Put something good in their bellies at the beginning of the day and my kids will stay smiling (mostly) for the rest of the day. As the chief cook and bottle, glass, plate and pan washer, I want Breakfast to be easy. We always do the traditional Sausage, egg, hash brown casserole. I mean always, like for the past 15 years at least. I love it, but I’m tired of it. And let’s be honest. There’s always leftover that you have to figure out a way to save in your already over packed fridge. My family devoured these rolls. I will tell you the girls preferred them without the onions and bell peppers so if you’ve got picky eaters in your house, feel free to leave them out. 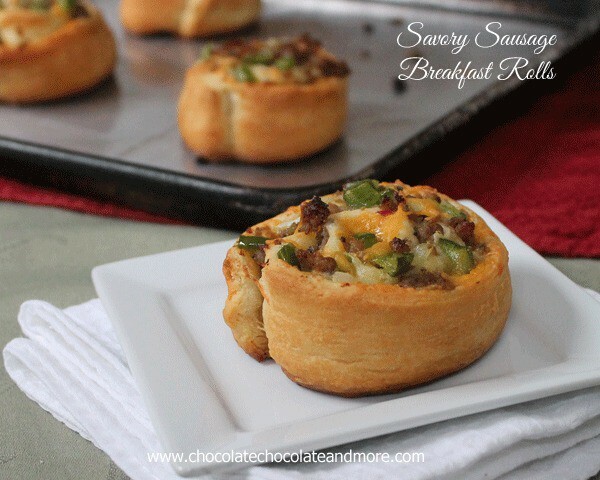 Don’t wait for a special occasion to make these, just turn any morning into that special breakfast! In a skillet, cook sausage, adding salt and pepper to taste, making sure to break up sausage. Remove sausage to paper towel lined dish to drain. In same skillet, add onion and green/red pepper, saute just until onion becomes clear. 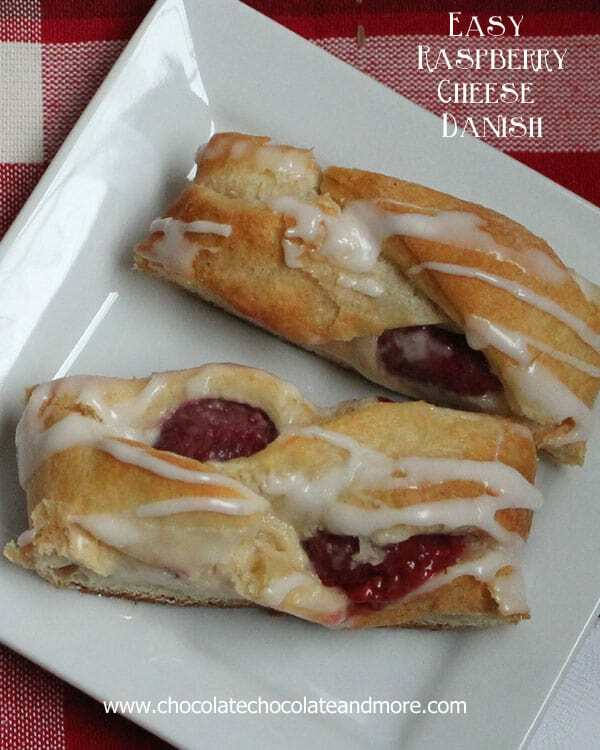 To assemble-unroll crescent dough on a cutting board, if using rolls, pinch seams together to seal. Brush dough with melted butter covering entire surface. 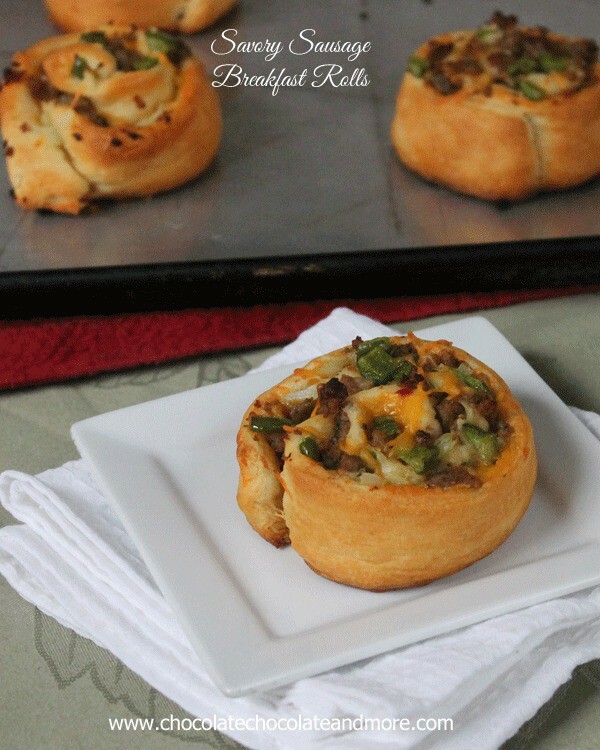 Spread shredded cheese evenly over dough, then cooked sausage and onions and peppers. From short end of dough, start rolling jelly roll style until completely rolled. Refrigerate dough roll for 20 minutes to firm dough up. Cut dough roll into 6 evenly spaced slices, place on lightly greased baking sheet, cut side up. Bake in preheated 375 degree oven for 15-18 minutes, until golden brown. Prepare sausage, onions and peppers the night before for easy assembly. 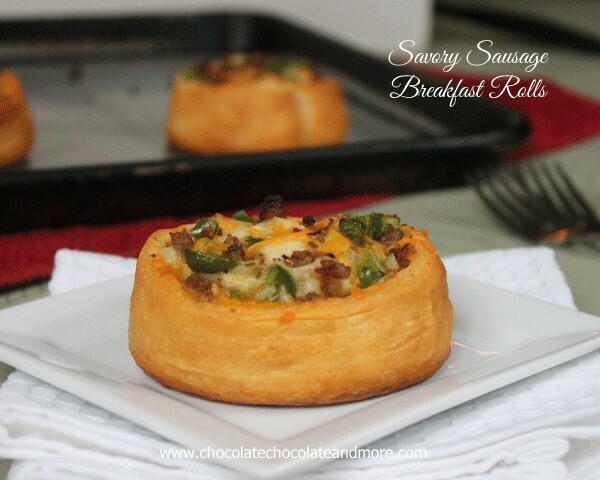 Want more easy breakfast ideas? These little bits look delicious! These are a great idea. 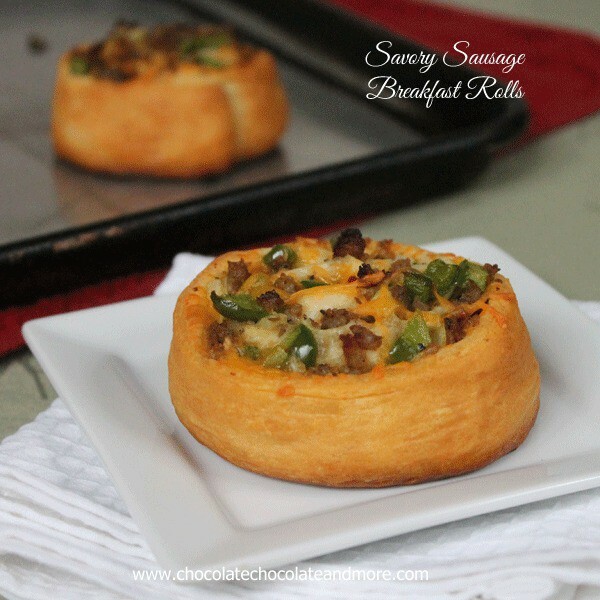 I’d love to try these with other things as well, like ham, bacon, and even Mexican chorizo. Has anyone tried to freeze any leftovers and reheat in microwave?? 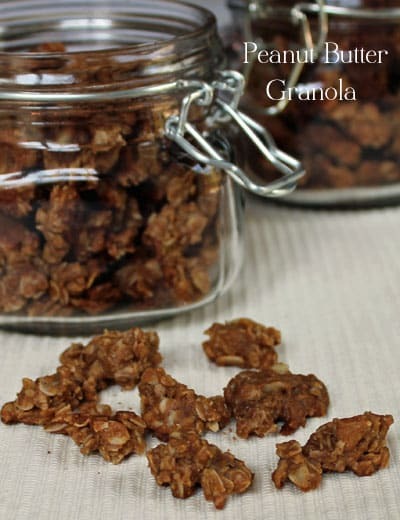 Can you make these ahead of time and bake the next day? If so how would you go about doing this? If I wanted to make ahead, I’d partially bake them, then reheat and finish baking the next day. 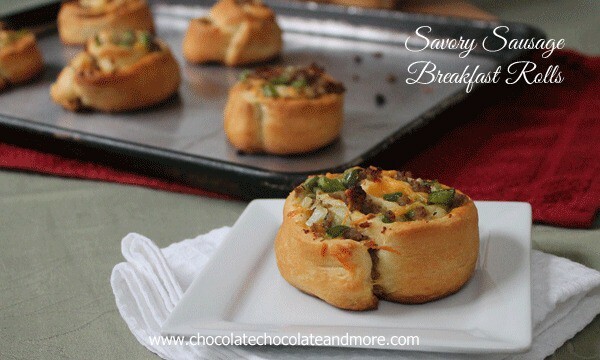 This looks like a perfect bake and take breakfast!! This seems so simple. Do you think you could bake them for a little less time, then cool/freeze them? That way you could microwave a few each morning? Thanks for sharing the recipe. Pinned to my breakfast board. You could try it. My experience with the crescent dough is it’s best when baked fresh. Microwaving it will soften the outer sides and instead of being crisp they’ll be soft.